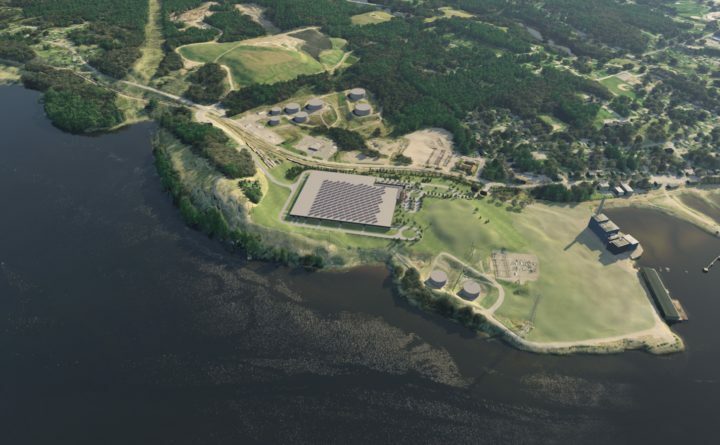 Computer renderings of Whole Ocean's indoor salmon farm, slated for construction at the former Verso paper mill site in Bucksport. An appeal of a state wastewater permit granted to Bucksport’s $250 million indoor salmon farm was rejected Thursday. The chairman of the Maine Board of Environmental Protection ruled that Belfast resident Holly Faubel has no standing to appeal the permit granted to Whole Oceans LLC in November to discharge water from the former Verso Paper mill site into the Penobscot River. The rejection reduces Faubel’s chances of having conditions imposed upon the proposed farm, the largest business slated for Bucksport since Verso laid off 570 workers and closed in 2014. Whole Oceans plans to expand an initial $75 million investment to eventually employ hundreds of workers in the annual production of 20,000 metric tons of Atlantic salmon. Faubel “has not demonstrated that her property in Belfast, her [financial] rights, or her personal rights will be adversely and directly affected by the [farm], or alleged that she will suffer injury or harm from the licensing decision in any way that is distinct from harm that would be suffered by the general public,” Parker wrote in a letter dated Thursday. Faubel would have standing if she can show that the project would damage her in ways distinct from any harm experienced by the public, Parker said. In her appeal, Faubel expressed fears that the plant’s discharge would stir heavy mercury contamination in the riverbed. She sought that Whole Oceans remove all mercury carried in the plant’s input water, filter mercury and ammonia from its discharge waters, and daily test its discharge for mercury or ammonia contamination. Efforts to contact Faubel were not immediately successful. Faubel has until Jan. 25 to appeal Parker’s decision to the full board, which handles appeals of permits issued by the Maine Department of Environmental Protection, Parker said. Faubel, who filed her appeal with the board on Dec. 17, also can appeal the permit in civil court, said Cynthia Bertocci, the board’s executive analyst. The DEP granted Whole Oceans the permit on Nov. 21, the last hurdle to the Portland-based company closing on a deal to buy a portion of the defunct mill site. Whole Oceans spokeswoman Angie Helton could not be reached for comment Thursday evening.